It’s a lovely day for eating the uncooked flesh of your friends and starting up a cult. 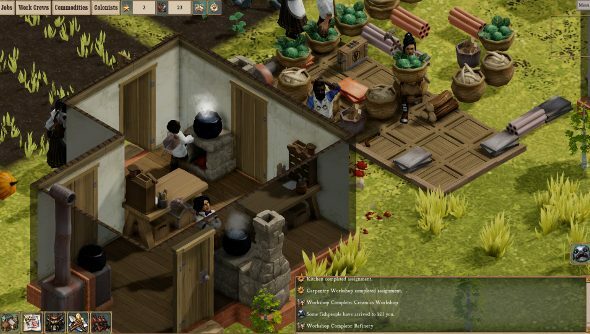 Clockwork Empires hit Steam Early Access today, so now you can sit back and watch an entire colony of people under your care lose their tiny minds. I’ve had a week with the build already, and it’s an intriguing teaser of what’s to come. But there’s a lot that isn’t in place. Basic colony management, ensuring that your colonists are well-fed and housed is most of what you’ll be doing, in between fending of fishpeople raids. The properly exciting stuff is yet to come. The summoning of elder gods and establishment of colony-conquering cults isn’t a threat at the moment. It’s up on Steam for £22.99/$29.99. Keep your eyes peeled for our Early Access review next week.